You'll find all manner of variations of roulette when you're searching for a game to play in a Canadian online casino. Some alternative versions have even taken to combining roulette with other internet gambling favourites. Spingo is just one example of these hybrid games that appear to be popping up everywhere, however, it is one of the most popular around. So we felt it only right if we guide you through the ins and outs of this fairly new variation of online roulette. Spingo blends the best features of online roulette and bingo to create a new game that is surprisingly easy to pick up. The 25 slots on a Spingo wheel are split into three different colours, red, yellow and blue (eight of each, with one slot for green). One of 21 numbered balls, selected at random, is shot up though a funnel (in a similar style to bingo games) and lands on one of the different coloured slots. There are two balls for each of the numbers 1-10, and one for the number zero. Players' can bet on individual numbers, individual colours or combinations of the two, while there are still some even-money bets like odd or even. Payouts are different to other types of roulette, and players can win big by correctly betting on a number and colour combination. High or low: A winning bet on high (6-10) or low (1-5) will pay out 1:1. Or even money. So, for example, if you bet $10 on low and the number 3 ball emerges and lands on any colour, you win $10 and get your original stake back. Spingo is an invention of the online casino era, and is only a few years old. Its speed of play and opportunity for big wins has made it popular with online roulette players in Canada pretty much from the get-go, while this simple and fun game has won itself many new fans, even if some might have been sceptical at first. It might not have the legacy of old fashioned variants like American Roulette or French Roulette, but for many Canadian players this is balanced out by how simple it is to pick up as a newcomer to online gambling. You won't be able to find Spingo at a land based casino, unfortunately. These venues generally adopt an 'if it ain't broke, don't fix it' approach when it comes to roulette, which means that many of the largest casinos in Canada are perfectly content to offer older variants of the game. Up until a few years ago Spingo wasn't even that readily available online, but this has changed as players have let their money and their mouse do the talking. Most of the best Canadian online and mobile casino sites will offer Spingo, and a lot of the time you can even play for free before deciding whether you want to move on to real money play. Spingo is bingo with a spin. It is blending the spinning style of Roulette with the randomness of bingo. It is played basically the same way that bingo is played, but in this case you are choosing numbers and colors. There are balls numbered 0-10 that shoot up individually through the center of the wheel while it is spinning. The ball will ultimately land on a one of four colors, red, blue, yellow, and one green space equalling 25 slots. You win when the ball lands on a coloured well that contains your number and the colour that you were betting with. Although the general look of the table and wheel is similar to standard Roulette, it is actually quite different. In place of seeing half of the number in red or black, you will see three rows coloured in blue, red, or yellow and numbered 1-10. The betting is borrowed from Roulette and has a bit of a difference when it comes to odds and options. You will find a High/Low bet, which is divided by 1-5 and 6-10, with a payout of 1:1. There is also the odd/even bet which pays out 1:1. If a zero shows, then you will lose your even money bet. Colour wins pay out 2:1. You can bet on zero, which pays 19:1. Individual numbers pay 9:1. Imagine betting on the one green space on the wheel and winning 23:1! Winning on colour/number combinations pay 31:1. So, you can see the betting variety gives rise to some awesome winning action. Spingo is a very popular game among Canadian players, especially Canadian bingo players who are looking to expand out their winning edge. 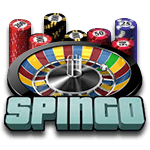 For Roulette players who are tired of the same old routine, Spingo provides them with a whole new style of play, with the same spinning excitement of Roulette. The key difference is that it implements a blending of colours and numbers as opposed to a static black/red, odd/even numeration system. In the case of Spingo, there are colours on the wheel with no numbers, and there are multiple balls as opposed to only one. The variety of options when it comes to winning makes for multiple ways of winning. The odds are different when comparing Spingo to European Roulette. European Roulette has a single number bet at 35:1, whereas a single number bet with Spingo is 9:1. But when you put a color and a number together and win it, then the odds are 31:1. Other differences are betting on zero and winning 19:1, or betting on the one single green slot on the wheel and winning 23:1. There are still even/odd and high/low even money bets available as with traditional Roulette. Go ahead give it a twirl - we think it is quite addictive and fun. This is one game where the best system is really managing your bankroll and keeping within traditional playing norms. Many believe that you should never bet more than 3% of your total bankroll at a time. Now, as your bankroll increases, you can increase your bet, or you can keep on socking away your winnings and only work off of the original bankroll. So, for every even money win, you won't increase your bet. But with every bet that is over 1:1, then you can up the ante a little higher and really capitalize on your play. In the event that you'd really like to apply a system or strategy, be certain to check out the most popular ones right here. The truth is that this very fun and engaging game of Roulette is not found at all casinos. Many of the largest casinos available to Canadian players do not have Spingo. So, it is important to choose the best casinos that do offer it as a Roulette variety. It just so happens that our team of experts have also had a great time trying out many casinos' Spingo games, and they are happy to share their findings with you. So, do not look any further - the best Spingo online Roulette sites are listed right here.